Religion is a starting point on the path of spiritual development. You are never asked or expected to leave behind your faith, no matter what it be. It is your starting point. Why would your God ever ask that you turn your back on his or her way? The most important function of any religion is to provide a code of behaviour and the understanding that we are loved and protected by God so that we may grow in the understanding of his (or her) wishes. Religion and Spirituality go hand in hand. Consider the growth of a child. A child needs to be protected. As the child becomes a youth, the absolute code is relaxed in favour of guidance and direction so that he or she may learn how to exercise independence and become a responsible adult. Have they left their life code behind? – no way! Your relationship with your God should only ripen and become more personal as you mature. Does Your God really want you to stay as a baby forever? I do not believe so. I suspect that Your God would like to see us grow and mature into good, strong and functioning adults. Everyone has the right to see God as they wish. There is the story of a wise Indian prince who was having problems with different religions and sects of religions causing instability in his territory. He gathered the leaders of the most troublesome groups and asked them about their problems. They talked for ages about how they had the only true path to salvation and how everyone else was wrong. The prince pondered this for a short time and arranged for them to be blindfolded and lead into the courtyard where they were presented with an elephant. Some were placed near the ears, the trunk, the legs, the belly and one particularly annoying individual near the tail. They were given 5 minutes to explore then returned inside. The blindfolds were removed and each was asked what they found in the courtyard. Some described warm tree trunks, others a large round firm sky, others big sheets and the annoying fellow held forth that they could not have done so as he had felt a warm tufty rope so they were all wrong! They were again taken back to the courtyard without blindfolds and shown the elephant. The prince then explained to them that they had each experienced different aspects and parts of the same being. He also gave them a warning that if they continued to cause him trouble that their heads would soon decorate his gate! 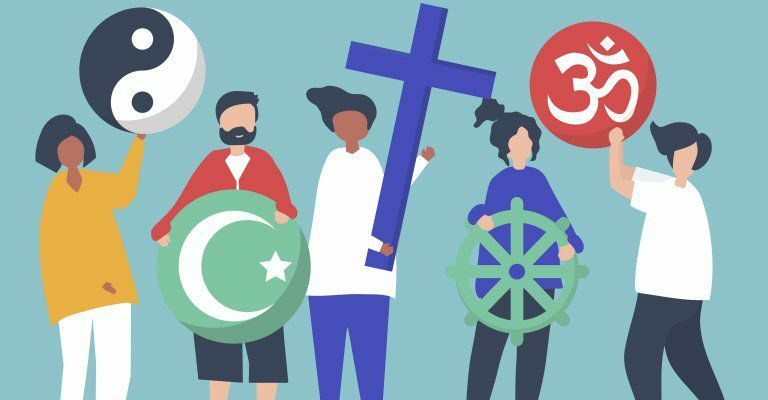 Is it not very likely that each religion can be considered to describe the different parts of God? We are not likely to stay as we are for ever. Surely God has bigger plans for us, if only to assist his archangels. As children we are given a fairly narrow amount of freedom so that we will not hurt ourselves or allow ourselves to venture into harm’s way. If we listen to those quiet messages we can understand more and more of the overall plan and our place within it. Consider the warning given to most children to beware of strangers. This warning serves to keep children out of harm’s way until they have matured and gained sufficient life experience to interact with other people safely. To shun contact with strangers is a little limiting when we are seeking a mate for life. At this point the responsibility for interaction becomes wholly that of the individual concerned, guided of course by the code of behaviour given to us by our parents and our God. So it must be that many of the constraints placed upon us as children are relaxed as we mature into functioning spiritual beings. To accept more responsibility, we need to develop the skills needed to perform properly in the environment we find ourselves in. 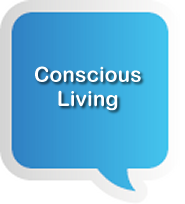 As we develop these conscious living life skills and learn to use them appropriately we mature. We know what is appropriate behaviour and why. We become closer to our God as a friend rather than a child. We are still guided through our life by the wisdom of our faith. Our increasing understanding widens the possibilities of our life. We are able to experience larger challenges and grow in our faith and understanding of God. As the size and complexity of our God given challenges increase, we will need to talk directly with God, to seek understanding and guidance. God will respond in terms appropriate to our level of growth and maturity. Each of these challenges builds our strength so that we may move toward larger and greater challenges. As we overcome these challenges our greater strength grants us new abilities. These may take the form of understanding or healing or whatever was associated with the challenge. These new skills are our rewards from our God for the effort we have put out on his or her behalf and so it goes. View it as a process of growth. We need to be stronger and smarter to take on larger challenges and the challenges themselves provide the strength, understanding and skills necessary to fulfill the next challenge. This is God’s plan for us. We must grow. To stagnate, is not helping to further God’s plan. God looks at us from a much higher point of view. He or she sees us as children in comparison. How can we be of any use or purpose to such a high being unless we make his or her life easier? Should your God need to continually change your spiritual nappies, to clean your snotty nose or mend your skinned knees? Would it not be more pleasant if we were to grow up, to develop a personality and be able to converse and help where we can? Everyone has a plan or agenda of sorts for their life. Gods must too. Simple observation of the beauty of our environment will often give us a clearer vision of God’s plan. Understanding comes from watching the movement of a cloud on a summer’s day, the swaying of a tree in the breeze, the reflection in the waters of a lake, the merry chatter of a flowing creek; these will all lead us to the quiet path to knowledge and more importantly, understanding. If we listen to those quiet messages we can understand more and more of the overall plan and our place within it. This is how God teaches us and leads us gently to our maturity. Until we can hear the directions of God, we will remain little more than superstitious savages subject to our coarse desires and driven by our emotions. If we are too afraid to seek understanding, we will serve no purpose in the greater plan. In fact, our very ignorance will often cause us to act in a manner that is in opposition to that plan. Learning and understanding are necessary components of any relationship. If we put in the effort, our relationship with God will become warmer and more rewarding. This is the same with any relationship. God wants to be our friend, not our boss. We need to be a little more mature in our thinking so that we can be that friend. Treat your relationship with God as you would with any other person who is important to you and whom you love very much. After all God loves us, we cannot allow that love to be one sided! That would be poor manners. To build a friendship we need to spend time with our friend, to converse with them to learn their ways, to give them small gifts and so show that we care and to show pleasure when we are given a gift. Remember “As ye sow, so shall ye reap”. We need to know and understand the things that are important to our friends so that we can act appropriately. Just because our friend is more mature than us, does not mean that we should not put in some effort ourselves. It simply means that our friend will understand when we do not quite make the mark. It does not stretch the friendship if we are genuine and do care and show this in our daily actions. Our attitude is the most important thing. Do we have the attitude that a friend can appreciate? No sensible being places him or herself in opposition to the plan of their God. This is risking all. Being in opposition to the greatest power in the universe is a serious career limiting manoeuvre. This is asking for a harsh lesson. Being forgiven and allowed to stagnate is possibly the harshest lesson we could be dealt. The entire purpose of our life is negated until we are prepared to move in the required direction. To make no progress in our assigned part of the plan is to risk being replaced by someone who has greater desire and a greater Will to assist God. We can be placed in a more menial position as we have not exercised our will to assist. If you were running the universe and had a minion who was not performing, would you not replace him or her with someone who was willing to help until such time as the laggard had a change of view? The plan must go ahead, with or without our willing assistance. Does it really matter whether we call the divine God or the Universe?